Models to accommodate one single, two single, one double, or two double racks. Stainless Steel construction with a built-in steam system - gas, oil, or electric. 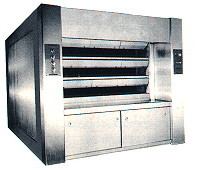 This vapor tube multi-deck oven features electronic controls, and can be heated by gas, oil, or electricity.